David S. Goodsell is an artist and Associate Professor of Molecular Biology at the Scripps Research Institute in La Jolla, California. He creates beautifully intricate and meticulously researched watercolour images of cellular environments and molecular structures in order to educate and make the often complex scientific world more accessible. 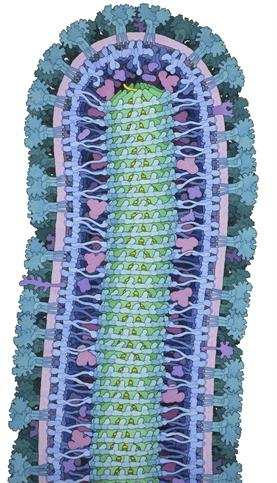 David was named as overall winner in the 2016 Wellcome Images Award for his depiction of a cross section of the ebola virus (pictured below). PRN spoke to David about his dual role of artist and scientist and how these roles work together to create a window into the microscopic worlds within our bodies. PRN: You have been described as “an artist by nature and a scientist by training” - would you agree with this? DG: That is very flattering! I find that my artwork is a great way to connect with the things I love about science. As scientists, we often get caught up in all the technical details of an experiment. The artwork allows me to step back and get excited about the bigger picture. PRN: What is the difference between scientific illustration in order to educate, and technical scientific illustration? DG: For me, it's all about context. When I approach an educational image, I try to capture the larger picture, and help the viewer put the subject into its proper context - in my case, presenting the role of different molecules inside a living cell. On the other hand, for scientific graphics, such as a journal publication or scientific presentation, the audience usually already understands this context, so the illustration can focus narrowly on the details of the subject. PRN: How much does artistic licence play a part in your scientific illustrations? DG: I need to allow quite a lot of artistic license in my paintings, since molecular and cellular biology are still very active fields of research and the new results are constantly being discovered. My paintings attempt to create an image of a portion of a living cells, showing all of the molecules at the proper size and shape, in the proper location, and at the proper concentration. Much of this information is known, but I'm forced to estimate this for areas that are still under study. PRN: Is it important to you that your work is seen for what it represents, or do you enjoy people finding their own worlds, narratives and abstract meanings from your illustrations? DG: I hope that they can be read in both ways, but I design the illustrations as a strict representational depiction, supported by the scientific results. PRN: Do you think we are more open to making connections between science and art since you first graduated in the 1980s? DG: Art and illustration has been used since the very beginnings of scientific study, as a tool to document scientific results and present them to colleagues and the wider public. I am happy to see, however, more and more fine artists exploring scientific subjects and bringing their unique perspectives on the discoveries and social significance of science. PRN: Do you think that creating imagery using watercolours and with a consideration of aesthetics as well as facts helps the larger audience to feel inspired by, and even take more interest in science in general? DG: This is my major goal in creating these illustrations - to capture some of the beauty of the natural world as revealed by science. PRN: Tell us more about how you plan to push your imagery in the future? Does it always come in tandem with your research? DG: The next big step in this work is the extension into 3D modelling. This will allow these types of scenes to be used as tools for research, as well as allowing a deeper understanding for education. As part of my research, we're currently approaching the structure of HIV this way, by building comprehensive models of the virus and its interaction with infected cells. The goal is to provide deeper understanding of the viral lifecycle and discovery of new weak points for antiviral therapy. Click on the link in the email we just sent to complete the process. Thank you!